Whether you’re looking to getaway with that special someone or the entire family, Wisconsin Dells Condos has a destination for everyone. The Dells has condos tucked in the woods, with a view of the Wisconsin River, or just steps away from the Dells popular attractions. Several of the Wisconsin Dells Condos are destinations in themselves with some of the largest indoor and outdoor water parks in the country. If your looking for an opportunity to rent, invest, or live in a condo in the Dells there are several opportunities for you. The Dells has several new luxurious complexes from units that are secluded wooded settings to units in the middle of the many Dells attractions. 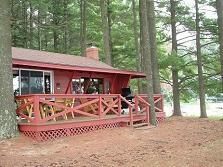 Cedar Lodge definitely offers distinctive Wisconsin Dells condos. Cedar Lodge is located off the beaten path in Lake Delton next to Lost Canyon on the Lower Dells of the Wisconsin Dells. It’s just minutes from all attractions in the Dells and just down the street from Lake Delton. Some Wisconsin Dells condos resorts have it all, and Christmas Mountain falls into the category. Mulligan’s Restaurant is onsite, and offers a Sunday Brunch, lunch, dinner, and even pizza delivery! Check out Wisconsin Dells Condos Chula Vista Resort for more information. We were given a short but revealing preview of the newest Wisconsin Dells condos just prior to opening. What we were given access to was very impressive with regards to the all new Glacier Canyon Lodge at the Wilderness Resort. You can choose from 1, 2 or 3 bedroom condos that are fully-furnished, have fully-equipped kitchen with a range, dishwasher, refrigerator and microwave. We’re talking about 224 luxury condominium accommodations nestled amid the Wisconsin Dells woodlands. Glacier Canyon Lodge also has an amazing 3-acre outdoor water park with an interactive lazy river. In addition all guests have access to 3 indoor water parks, and 2 outdoor water parks at the adjacent Wilderness Resort. Welcome to a Wisconsin Dells condos look and feel of years gone by. This little piece of heaven is part of a small peninsula on Lake Delton. As we drove into the 15 acres of shaded seclusion, it was apparent that the owner of this property put a lot of thought into preserving the beauty of the land and the buildings as one. 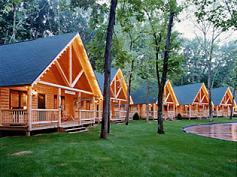 The Wisconsin Dells condos, cabins, or house is individually owned but rented out through a management company called Lake Pointe Management. In order to check in to your cabin at Island Pointe, you need to take a drive just up and across the road about a ½ mile or so at E11232 Hillside Drive. Call real early because this place books out for the summer very fast. Make memories with your family today at Island Pointe…I know we will! Check out Wisconsin Dells Condos Kalahari Resort for more information. Check out Wilderness Resort for more information. Please call these Wisconsin Dells condos, or check their websites for updates and changes! We have supplied information with websites and toll free numbers to call the majority of these resorts.